We like to travel. We like to see new faces and ancient places. We want to see the sights and find out how the rest of the world lives. One day we were sitting around looking at a map of our travels, asking "Where will we go this year?" We noticed that we had at least set foot on all of the continents. No, wait, we had missed one! Antarctica! 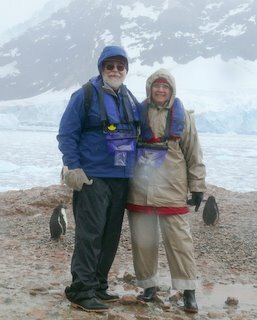 Just as we had decided to visit China's Three Gorges before they flooded, we figured we should see Antarctica before it melted. On most of our other travel web sites we progress through the places we go or the days we spend in an orderly fashion: "First we went here, then we went there..." That worked fine for the cities in Argentina, but Antarctica doesn't lend itself to that approach. Each landing we made in Antarctica was like reading another chapter in a whodunit. We got a few more pieces of the puzzle. We saw different penguins living in slightly different environments. We saw different sorts of glaciers and different shapes of icebergs. Slowly a picture of the whole starts to take form, slowly we learn what Antarctica is like. It would take a lifetime of study to understand the whole of the white continent, and by then it would have changed significantly. There are thousands of researchers, each pursuing their own little corner of the mystery. We cannot pretend to present their answers, the best we can do is to take the few bits of information that we garnered during these brief days, and arrange them in a way that will hopefully give you some insight into what we have learned from our expedition into the frozen bottom of our globe. Just as there is no proper order to visiting the pieces of Antarctica, there is no proper order to visiting those pages of this site. We hope you enjoy it, and come away with some of the sense of awe that our visit left us with.